The Bluetooth Special Interest Group (Bluetooth SIG) has announced the finalists in the 2011 Innovation World Cup. Out of nine finalists, five of which were health and fitness related products. The Innovation World Cup is an annual developer contest in which teams develop new products using Bluetooth technology. This year there were 330 submissions. FIrst up: CoreMD, image on the left. Developed by Guilherme de Paula of Pancreum, CoreMD is a wireless communication and power infrastructure for replaceable wearable medical devices. The devices are envisioned to perform a wide variety of functions such as sense vital signs (ECG, temperature, blood pressure, fetus activity, etc), provide users biofeedback, and potentially even inject sub-cutaneously delivered drugs (insulin, glucagon, etc).The CoreMD device is reusable and runs on a coin-cell battery that can be recharged using a micro USB connector. The other four health and fitness related products are profiled below. 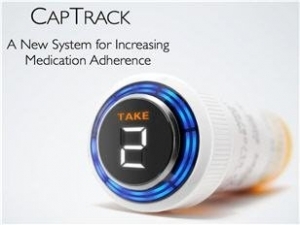 CapTrack, by Daniel Corkum, Rosanna Myers, and Maura Tresch, is an innovative new system for increasing medication adherence. Their “Connected Caps” fit onto any standard prescription bottles to keep track of medication adherence and help patients make the most of their treatment regimens. Using methods very similar to Vitality GlowCaps, the Connected Caps use light and sound, as well as call users phones or send them emails to remind them to take their pills. CapTrack also offers a web-based service which generates real-time progress reports for users, their doctors and select family members, and even calls the pharmacy to order a refill when users run low on a medication. Monbaby, by Arturas Vaitaitis and Jung Bae Kim of Rentech, is a small sensor bracelet worn by newborn babies that measures their vital signs and relays them to multiple receivers. It is specifically designed to mitigate against the risk of Sudden Infant Death Syndrome (SIDS). Bracelets can be paired with a wristband worn by the parents. The wristband will then receive data being transmitted by the baby’s bracelet and function as an active remote monitor for the newborn. The data can also be received by a centralized data aggregator, allowing nurses and doctors access to real-time vital signs in the nursery. The smartphone app and receiver devices can send alerts over multiple channels if a baby’s vital signals reach unusual or dangerous thresholds. SoundofMotion, developed by Vlad Savchenko, has extended the traditional functionality of Bluetooth sport headphones to measure heart beats and instantly provide audible and tactile feedback to the user. Using electrically conductive earbuds, the headset will be able to measure the heart beat of users in the same way as a traditional chest belt heart rate monitor. Unobstructed skin, natural body oils and moisture in the ear make the heart beat measurements very reliable. The dual-mode Bluetooth device will allow the headset to work as a heart rate monitor in Bluetooth low energy mode, or as a stereo audio system in classic Bluetooth mode. Smart Weights, by Eric and Meaghan Zorij or Diesel Dogs, are simply standard weight lifting equipment with the addition of a Bluetooth low energy transceiver which provides the ability to monitor, track and log the exercises performed and automatically upload the results. 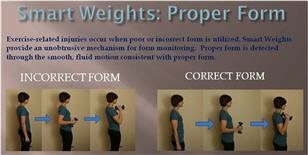 For each exercise, Smart Weight can measure form and technique, number of sets, number of repetitions, resistance levels, and duration. The workout summary is seamlessly uploaded via Bluetooth low energy technology to a smart phone or Bluetooth enabled PC or smartphone. Separate software on the phone or PC allows the retrieval of workout data, including information about form and technique used for each repetition and progress tracking, including monthly summaries and and exercise routine program design. 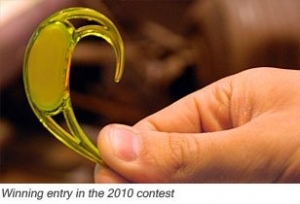 The overall winner in the 2010 contest was a small sensor that could be worn on a person’s ear to measure balance, body posture, activity level, and heart rate and transmit that information wirelessly to a computer, phone or other device where it could be transferred to a patient’s health care provider. The 2011 Innovator of the Year winner will receive a $5,000 cash prize, a Bluetooth Qualification Program (QDID) voucher worth $5,000 to $10,000 as well as a Bluetooth protocol analyzer from Ellisys. The Bluetooth SIG will also help the nine finalists present their idea or prototype at three of the world’s largest trade shows; the Consumer Electronics Show in Las Vegas (January 2012), MEDICA in Dusseldorf, Germany (November 2011), and ispo in Munich, Germany (January 2012). The picture shown on the Pancreum article is of the PDA (Personal Diabetes Analyzer) hand-held controller. It could be used by visually-impaired diabetics, as it would announce its menu position or status by saying, for example: “Your glucose is 110 mg/dl”.